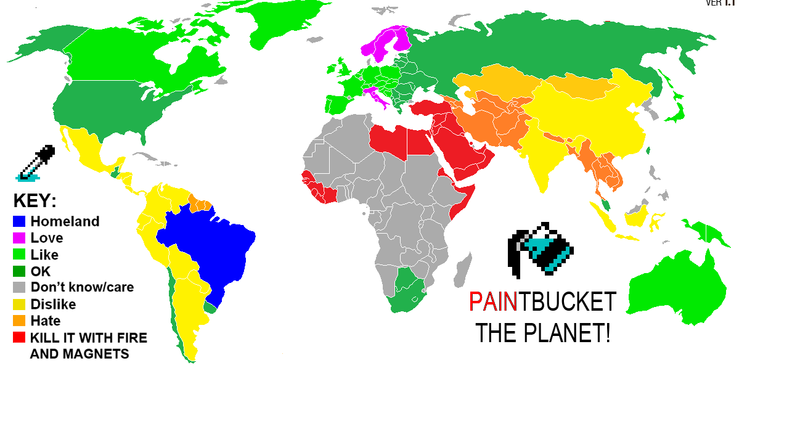 Have you ever done "paintbucket the world?" Yes or No? Yes, when i was little. I did when i played with my toy army men. 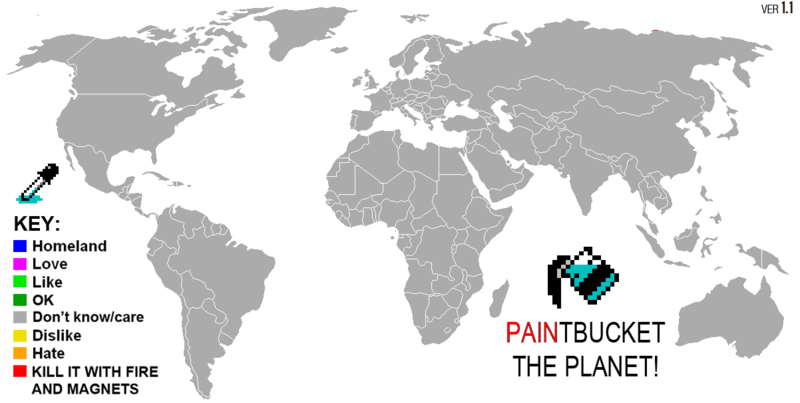 It represented each country I took over. They hate freedom. I hate people who hate freedom. I like that "KILL WITH FIRE AND MAGNETS"
http://i.imgur.com/aMsXk5q.png. 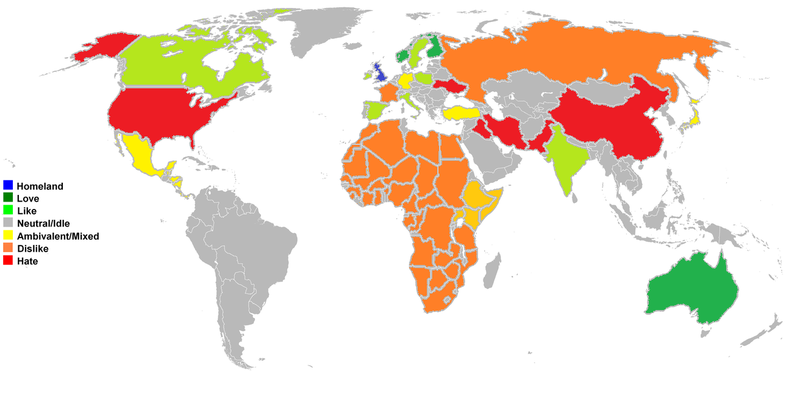 I never realized that I disliked so many countries. Not many Europeans like America. What's so bad about America? Why do you love North Korea?? Love almost every country in Asia,whats wrong with north Korea anyway? I dunno. Concentration camps, public executions, secret police, mass surveillance, torture, no freedom, threatens world peace with nuclear warfare, and overall human rights violations. Just stuff like that. guantanamo bay? secret police? well sure there is NSA which gives no privacy to anyone.No freedom? yea thats true,in some states in US people aren't allowed to carry ice cream in their back pockets,like wtf.US soldiers did commit public executions,not in US but in Iraq.watch this vid:http://youtu.be/B6hp8HMstkE?t=2m40s US hasn't threatened to destroy another country with nuclear weapons in like 70 years,Oo thats a blessing. Guantanamo bay isn't in the united state, and as for the ice cream I didn't say not much freedom I said NO freedom. North Koreans have zero rights, and I don't care who they execute as long as it isn't in America. you said public executions,i posted evidence that US soldiers commited public execution(s),now what do you want? you are seriously asking whats wrong with north korea? then why would you put red on U.S. and purple on North korea? cuz North korea is in Asia and i love the Asian culture,most of it. No but it Looks interesting. Why do you want to kill Senegal with fire and magnets?